Learn the ins and outs of dating in Kim Kardashian: Hollywood. Kim Kardashian West is on top of the world with the release of her popular mobile game, Kim Kardashian: Hollywood, which is currently available for iPhone and Android devices. Staying on Apple's App Store top 10 list of free mobile games for a second week, it's no surprise Kim's raking in the dough and charming her way to a $28 million earning year. Kim's success didn't come easy. She created opportunities to build her brand with the E! Network hit Keeping Up With The Kardashians, doing public appearances (clubs, shop openings, parties, events) and staying in the limelight by dating celebrities. It's not an easy road to stardom, and as you've seen in the game, dating celebrities is a good way to make it onto the celebrity A-list. We're going to give you a few tips and strategies on how to navigate your way around the celebrity dating scene. How do find a date in Kim Kardashian: Hollywood? You'll have no problem finding a date in the game. Going to meet and greets and flirting with people could keep your dating schedule full. Flirt with people to add them as contacts for dating, or network with them to help you with professional gigs. Once you have a few contacts, check their fan following and list status and make it your business to actively date. If you're a bit shy or just getting out of a long-term relationship, Kim will get you back on the dating scene with one of her friends. How to pick the right date in Kim Kardashian: Hollywood? You've met a few people, and if you play the game long enough, Kim will set you up on date with one of her friends. You can choose your type, starting with Sporty or Artistic; if you have enough charms, you can get Kim to set you up with someone really special. Choose the type of girl you feel you can connect with. It really doesn't make a difference. There's a strategy to dating in Hollywood. Pick a date with more fans and is of a higher celebrity listing than you. It's important that you date a higher celebrity lister to increase your fans and help gain experience faster. 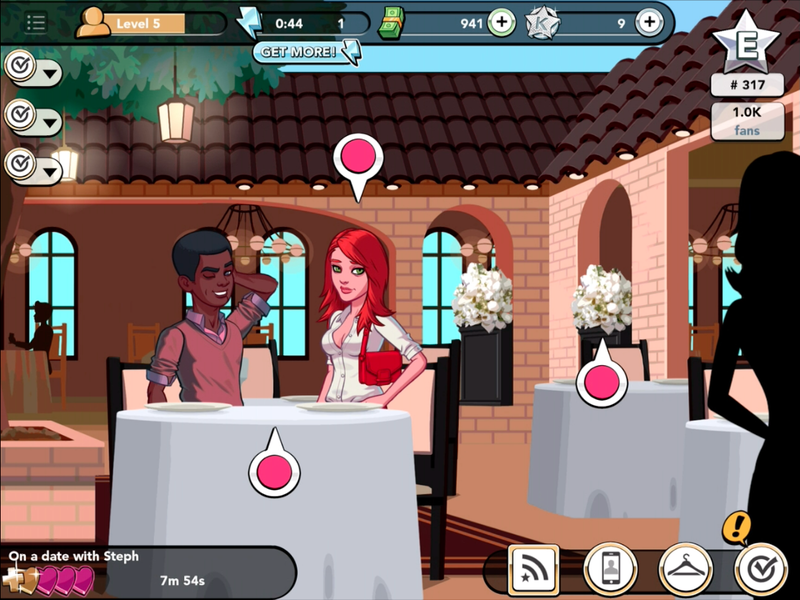 How to have a successful date in Kim Kardashian: Hollywood? If you want to have a successful date, you must dress to impress and prepare to spend some money. Keep in mind that dates last an hour, so you have limited time to make a good impression. Make sure you have a decent amount of money and get plenty of rest because you'll need the energy to complete dating tasks. Each task takes energy, and the tasks vary in the amount of energy needed. You don't have to spend any money on a date to make a lasting impression. The key to a successful date is to try to fill the heart meter within the hour; you have four hearts to fill for a perfect date. Romantic Glances and Kissing don't cost a lot of energy, and they add to your meter incrementally. If you're a baller with money to impress, we suggest you spend some money and go for the chef's special, fancy wine or dessert (all low in energy cost), but be prepared to spend to get the added benefit of a substantial increase in the heart meter. If you're broke and have a lot of energy, Flirting, Romantic Glances and Kissing is the way to go. Having a successful date will work in your favor and bring you close to the A-list celebrity ranking. Positive results from a successful date will raise your fan following, create more opportunities and raise your experience. Continue to date more influential people and you'll reap the social benefits of choosing a suitable celebrity mate. You have a few tips and strategies for dating in Kim Kardashian: Hollywood. Use this information wisely to find, pick and have a successful date, as it can put you on the path to stardom. Take a few notes from Kim's dating history and you'll understand.